Hello All! I picked up a Miss Kate jelly roll and finished up this quilt top over the weekend, but between the rainy weekend, and the short daylight hours I've been foiled in my attempts to get a good picture of it. I rushed outside before school today and snapped this one in the morning light. I had fun putting this one together. I've always liked coin quilts, but I wanted to make it a little more interesting by randomly arranging the coin strips. It takes a little bit of planning, but I like the look. Since this is such a great use of a jelly roll, I'm thinking of writing the pattern for it. What do you think? That is really cute! I struggle what to do with jelly rolls sometimes. I think a pattern would be great and this layout is fun. This is really cute. I like how in some spots the white just looks like another piece of the strip, so it makes the strip look really long (like at the bottom row). I think a pattern for this would be great! 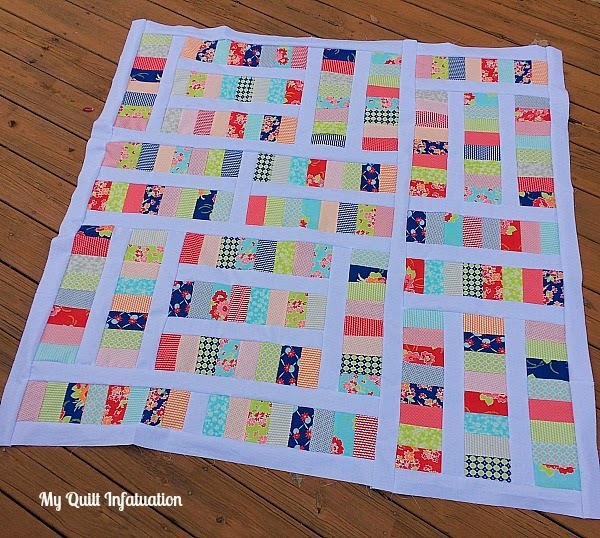 I love the way you put a spin on a typical coin strip quilt! Love the quilt! Pattern, please. Understand the cold thing, we have reached our high today of 21. Very nice quilt top. Being new to the craft, I have not heard of coin patters. Please do write one up. What a fun design when it's done like that! Love it. Fun fabric and pattern. Did it freeze to the deck? Would love a pattern! Very cool! Love the quilt and would really like the pattern! I'd like to see the pattern. I happen to have a Miss Kate jelly roll that I could use. Kelly, it's pretty, fresh and cheerful! I've seen several and made several coin quilts but I really like how your layout. YES you should write up a pattern for it! Fabulous quilt! I love how you mixed up the coins! Brrr....16 degrees!!! I am so over this weather already! I love it, I think you definitely should write a pattern for it!!! I like how you have the strips sets going in both directions...adds a lot. I haven't used jelly rolls, but I do like to make coins from yardage. This is a cute quilt, and something I'd make, especially for a quick quilt for donation. I think a pattern is a good idea. What a great pattern. You colors are marvelous. Great design Kelly, definitely write up a pattern! I recently made a quilt using Miss Kate fabrics, they are so neat! You did that in a weekend?! I'm so jealous! Beautiful I love the Miss Kate fabric! Yeah! I really love how you randomly oriented the strips - this is super cool! RIght....with all this cold weather I couldn't get an outside picture this week either. Thanks for sharing under our Jelly ROll theme this week Kelly! What a great idea....super quilt!! This is super cute and I hear you on the limited hours and freezing cold. Thanks for braving the weather to share this!